The majority of offices in the US, UK and Australasia today are open plan. This is great for collaboration, but it can actually be difficult staying healthy in these environments. As the number of people sharing a room increases, so does the risk of getting ill due to poor hygiene. By implementing a hygiene strategy in the office, employers can increase both productivity and well-being by reducing sick-days and hygiene worries. 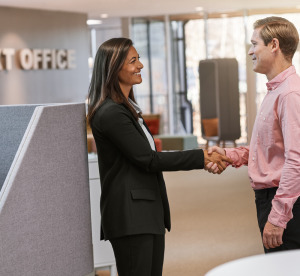 By strategically using the Tork Hygiene Stand and Tork EasyCube® at locations in the office with high traffic, companies can provide employees with more opportunities for hand hygiene.